The main idea of the essay is the replacing of the slave/peasant class with automation (robots and machines) assisted by voluntary association, and then using the capital produced for the common good, to free the lowest class from poverty, insecurity, and indignity. In other words, in this ideal system, the government would be in charge of helping to organize the labor and automation needed to do the “necessary” “producer class” jobs (whose fruits would then be shared by all), and that would then free “the many” from poverty and insecurity and give them room to seek their own path as individuals and creators of “luxury items”. The idea is that this would be better than the wage slavery and chattel slavery that has been a main feature of just about every society since forever. TIP: To be clear, we are reviewing Wilde’s work, not suggesting these ideas be embraced as gospel in isolation. I could make cases for why many safeguards would be needed to avoid a system like this becoming tyrannical or exploited, and cases for why this would pair well with a capitalist system (rather than acting as a replacement), and I’m sure the reader could too. The idea here is to understand what Wilde was saying first, and then to judge that idea second. TIP: Although Wilde hardly discusses every aspect of this system, and does denote the idea of the elimination of private property, generally we can infer that capitalism could still be practiced for the non-necessary and luxury markets, just not for the necessary (in other words, he says there is no private property, but nothing beyond that demands his system actually has no private property or capital in terms of luxury items). So everyone gets to eat, people can work “dirty jobs” if they wish, and ideally no one is forced to do a job directly or indirectly, but also, not everyone automatically gets a Yacht and the government wouldn’t be in the Yacht business (or even in the luxury food or drink business). Here the bottom is lifted up, but everyone, including the top, is offered more liberty (not less). The whole idea is that the individual, not the collective, is the most important. A system like this, where the free market competes with the government indirectly, is hardly a “fully socialist” system. TIP: Try to read the review below with an open mind. The concept is obviously a bit idealist, but it is also rather prophetic and “realist” given recent advances in tech, the nature of the class pyramid, and the discussions of a UBI. Wilde is applying a libertarian socialist ideology specifically. It is a mistake to equate this with authoritative socialism based on existing bias (especially given that roughly half the essay is about being against tyranny of all forms, be they oligarchical or Communist… which is more than we can say for some civil religions and political theories). Oscar Wilde wasn’t just a libertine aestheticist and playwright, he was also somewhat of a prophetic libertarian socialist, as can be confirmed by his 1891 political essay The Soul of Man Under Socialism. This short essay, which one must assume (more than his non-political work or Platonic qualities) explains his harsh prison sentence, is an easy read that hardly needs a summary (read The Soul of Man Under Socialism in full here). With that in mind, below are a few key points and passages that will offer you the gist of the work without having to read it. First, let’s discuss the main theme in a bit more detail than we did above. The soul of a man under Wilde’s non-authoritative individualist socialism, where socialism and automation replace demeaning jobs, extreme poverty, and insecurity, is an enlightened soul. Wilde claims that this form of socialism will breed a type of individualism only known to poets like Byron, Shelly, and Wilde (only known to the sons of aristocrats, who never worked a day in their life, who never knew insecurity, and were instead free to dedicate themselves to individual expression, thinking, and learning). “Private property has crushed true Individualism, and set up an Individualism that is false“, as Wilde says. It has set up a sort of oligarchy / wage-slavocracy where good-hearted moral capitalists try to solve the ills of private property with private property itself (for example, they try to solve poverty with charity). However, this noble effort of charity only creates a cycle in which the oppressed stay oppressed without realizing it (Wilde implies that the slave owner who treats their slaves well is the worst, because it covers up the true horror of slavery). When the slave mentality is compounded with propaganda, it creates a class who doesn’t even realize it isn’t free, a class whose ability to eat depends on charity and the weather (for example if one shovels snow, they can only work when it snows). The idea of this form of socialism then is to replace Gilded Age capitalism with a non-authoritative form of individualist socialism in which economic and political power is never transferred to the state (but remains with the people). This is notably different than Stalinist collectivism (where a despotic government forces industrial tyranny and is therefore even worse than the pure capitalism). Instead, Wilde’s theory is informed by Peter Kropotkin-style libertarian socialist anarchism and leaves lots of room for expressions like the capitalist production of luxury items (we can hardly imagine that Wilde wouldn’t have wanted to compete in the marketplace of ideas with his plays or not be rewarded for writing them). With that in mind, obviously this whole essay is rather idealist (and one would assume Wilde would have extra considerations here in 2017), but 1. so anarchism and libertarianism in general are idealist, and 2. it makes it clear that socialism can, on-paper at least, be non-authoritative and actually breed individualism (two things that an oligarch will never admit). FACT: Sparta had a constitution that was similar to what Wilde describes, albeit it was far more nationalist and less egalitarian. Below is are some of the main themes in the essay, explained with quotes, roughly in the order they appear. People are naturally driven to do good by their “moral sentiment” (so to speak), but pure capitalism only allows for the offering of charity and what we would today call “low wage” “dirty jobs“. He explains it well as, “Just as the worst slave-owners were those who were kind to their slaves, and so prevented the horror of the system being realised by those who suffered from it, and understood by those who contemplated it, so, in the present state of things in England, the people who do most harm are the people who try to do most good“. 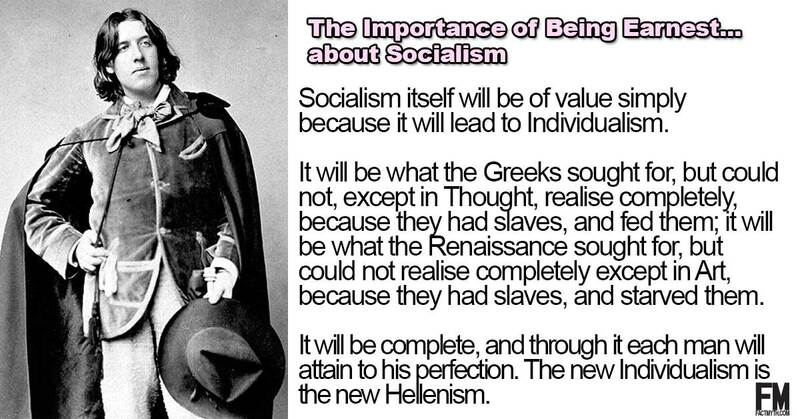 Socialism itself will be of value simply because it will lead to Individualism. In other words, when people are free from demanding jobs and insecurity, then everyone will be free to pursue their interests. This one of the key statements that makes Wilde’s political essay worth consideration (the others are his ideals of non-authoritative socialism and his thoughts on the purpose of automation). In other words, this is less about the elimination of private property and more about anti-authoritarianism and individualism. Although Wilde does suggest the elimination of private property, it isn’t about forcing workers to do jobs. It is more about replacing those demeaning jobs with automation and socialism and freeing up people to do jobs like philosopher, artist, and innovator. Wilde disliked the idea of the state organizing labor and disliked the idea of charity, he would likely in retrospect support some degree of capitalism as his ends were utopian, humanist, and idealist (not centered around some commune of workers). “Socialism, Communism, or whatever one chooses to call it, by converting private property into public wealth, and substituting co-operation for competition, will restore society to its proper condition of a thoroughly healthy organism, and insure the material well-being of each member of the community. It will, in fact, give Life its proper basis and its proper environment. But for the full development of Life to its highest mode of perfection, something more is needed. To be super clear here, Wilde is against tyranny and economic oppression in ANY FORM. He is saying, “What is needed is Individualism. If the Socialism is Authoritarian; if there are Governments armed with economic power as they are now with political power; if, in a word, we are to have Industrial Tyrannies, then the last state of man will be worse than the first.” Wilde would have fully rejected Stalinism, he sought socialism in a form that favored individuals and their dignity, not states and their economic power. Wilde goes on about automation (I don’t want to underplay this, his idea of replacing the bottom of the class pyramid with machines is the best idea in the book; it is actually a socialist idea that might work some day). In other words, the problem with democratic capitalist society is that the oligarchs and tyrants shape public opinion and low-wage hard labour depresses and corrupts individualism, so we actually have an oppressed oligarchical collective of wage slaves who vote against their own interests. Again, me thinks this explains the prison sentence (where Wilde was forced into hard labour for acting upon being gay and soon after died). “The evolution of man is slow. The injustice of men is great. It was necessary that pain should be put forward as a mode of self-realisation. Even now, in some places in the world, the message of Christ is necessary. No one who lived in modern Russia could possibly realise his perfection except by pain. A few Russian artists have realised themselves in Art; in a fiction that is mediaeval in character, because its dominant note is the realisation of men through suffering. But for those who are not artists, and to whom there is no mode of life but the actual life of fact, pain is the only door to perfection. A Russian who lives happily under the present system of government in Russia must either believe that man has no soul, or that, if he has, it is not worth developing. A Nihilist who rejects all authority, because he knows authority to be evil, and welcomes all pain, because through that he realises his personality, is a real Christian. To him the Christian ideal is a true thing. And yet, Christ did not revolt against authority. He accepted the imperial authority of the Roman Empire and paid tribute. He endured the ecclesiastical authority of the Jewish Church, and would not repel its violence by any violence of his own. He had, as I said before, no scheme for the reconstruction of society. But the modern world has schemes. It proposes to do away with poverty and the suffering that it entails. It desires to get rid of pain, and the suffering that pain entails. It trusts to Socialism and to Science as its methods. What it aims at is an Individualism expressing itself through joy. This Individualism will be larger, fuller, lovelier than any Individualism has ever been. Pain is not the ultimate mode of perfection. It is merely provisional and a protest. It has reference to wrong, unhealthy, unjust surroundings. When the wrong, and the disease, and the injustice are removed, it will have no further place. It will have done its work. It was a great work, but it is almost over. Its sphere lessens every day. Nor will man miss it. For what man has sought for is, indeed, neither pain nor pleasure, but simply Life. Man has sought to live intensely, fully, perfectly. When he can do so without exercising restraint on others, or suffering it ever, and his activities are all pleasurable to him, he will be saner, healthier, more civilised, more himself. Pleasure is Nature’s test, her sign of approval. When man is happy, he is in harmony with himself and his environment.